L'Ombre dans L'Eau was launched by Diptyque in 1983. The notes are listed as black currant leaf and Bulgarian rose; Diptyque describes the fragrance as "the scent of a green riverside garden." It was created by Serge Kalouguine, who was also the perfumer for Diptyque Olène. L'Ombre dans L'Eau, like yesterday's Ecume de Rose, gets off to a somewhat rocky start, with an overwhelming burst of green (and I love green notes, mind you). It is harsh, maybe even astringent. The green remains — if you don't like green, there is little point in even trying it — but it does calm. There are crushed green leaves. There is the bitter smell of broken stems. There is a light sprinkling of fresh herbs, and one or two pine needles. There is the smell of freshly overturned soil warming in the sun, and a bit of tartness from the black currant. And yes, there are roses, but they are muffled by all the green. Roses from a distance, perhaps, wafting over from next door while you are working in your own garden, where nothing has bloomed just yet. L'Ombre dans L'Eau beautifully captures the smell of early summer outdoors, but if what you are looking for is the glory of a just-opened rose, you'll need to look elsewhere. It is crisp, a bit sharp, and just about linear once the top notes calm. 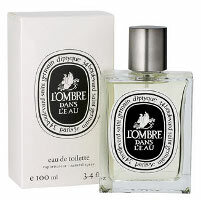 It is one of my favorite rose fragrances, and L'Ombre dans L'Eau is also one of my favorite fragrance names. Unlike many, it sounds just as lovely in English: Shadow in the Water. L'Ombre dans L'Eau is an Eau de Toilette, and is marketed as a unisex fragrance. For availability, see the listing for Diptyque under Perfume Houses. I'm going to try this next time I go to Art With Flowers; my Trois experience has led me to believe I need to examine these more. Thanks for the lovely review. I like the idea of it better than the reality. I like green fragrances, but the harshness of the blackcurrant bud notes is not that appealing to me. Maybe, I need to revisit again. I love the green, watery notes at the start of l'Ombre, but then it turns slowly to jam – the fate of all rose notes on my skin! I agree with V, but the name is lovely! Gosh I wish there was an Art with Flowers in my town!! You've tried Virgilio, right? Ecume is so pretty, whichever season it is at the beach…and hugs to you too! Thank you for the lovely review. L'Ombre dans L'Eau is my picnic in the park-fragrance. Spririted and carefree. I like the “greenness” in a fragrance if it is followed by a complementary smell, like gardenia o muguet, but I don't get green notes with roses, specially with Bulgarian rose, that have the particular property to smell like “turkish delight”. Hiding this rose (the most expensive oil in the world!) is a SIN per se! Another nostalgia scent, M? I don't remember my grandmother's garden, if she had one. The soap is perfect. I have this one & used to have Philosykos, love both of them. Yes, spirited & carefree is the perfect description! I don't mind my green straight up, no chaser. It is hard to make something too green for me — but I do see your point! How enticing you made this sound. I went to Neiman Marcus today to try it, but they had no tester (why an upscale place like this can't be better prepared escapes me). The only thing open was the shower gel (why? is someone going to wash up at the counter?). So I put some of the gel on my hand. No discernable smell. SA adds a spritz of water which brings out a little waft of scent. I give up on testing, and just buy it. Fantastic. Then I got home and my weekly package from Luciouscargo was waiting. Jacinthe de Bois. More fantastic. And that's just the most recent. I am so glad you liked it since you ended up buying it unsniffed! It is true that NM rarely has testers of them open, although sometimes they do have candles you can smell. And very glad you got some Jacinthe before it disappears, I am so sorry they discontinued that one. But a *weekly* package from luscious! You must be building up quite the collection, LOL!! Yes, the collection of full bottles is beginning to grow. Don't even ask about the number of decants I've purchased on Ebay. I'm glad I got the Jacinthe, and am even wondering whether to grab another one while I can…but they don't keep forever, and how much can one person wear? I haven't even ventured into NYC yet, even though I'm only a commuter train ride away. I think I'm afraid of the damage I could do. But I'll have to do it soon. When the weather is good. I can even meet the DH for lunch (or drag him along for testing). As long as I get back before the kids get home, and I turn back into a houswife. LOL. Funny that you should talk about a rocky start. Before it settles down to a (not unlovely) green tomato plant on me, I find the opening seconds and first few minutes of L'Ombre dans l'Eau to be one of the most extraordinary things I've smelled – cold and dark yet sweet and leafy and radiant, like river plants on a chill misty morning. It's smashing and it's one of my favourite Diptyques. If it could hold that opening splendour for longer I would love it even more. I love green notes, so I don't object to the opening even though I find it a bit harsh — but I know many do. Agree that it is a fabulous fragrance, and I think underrated in general. It just goes to show how much of what one feels toward a fragrance is influenced by context. In college I had a bowl of rose potpourri that smelled exactly like the rose signature in this fragrance. Granted, it was high-quality potpourri, but it still had that “air freshener” association. I love love love L'ombre opening; what a shocker, the green, the sap, the bracing woodsy-ness, and it dovetailed nicely with the tart cassis middle. But the rose, I cannot get over the rose. It just screamed “room potpouri” to me, and I can't wear that. Fresh Index made a Pear Cassis fragrance at one time, and the cassis in L'ombre is very much like that, although it's linear and never goes anywhere else after the opening act. The green in L'ombre is very much in character of the green opening in Bel Respiro, to my nose. And since I've been wearing Bel Respiro every day this spring, I've become even more addicted to this sort of bitter herbaceous greens, more than the tart green that typically describes frangrances like Vent Vert, Patou 1000, Quelques Fleures. Interesting — it is L'Eau that reminds me of potpourri. I love that sharp green too. Bel Respiro is much softer, to me. Did you get to smell Gobin Daude's Sous Le Buis before it was discontinued? You probably would've liked that one. I keep hearing about this Sous Le Buis and I can't find it anywhere. Didn't even know it was discontinued. I've read that Seve Exquise also falls into this bitter green category. In typical Chanel fashion Jacques Polge dusted Bel Respiro over with aldehyde and I think it made the dry-down more powdery, and yes, softer and sweeter, I agree. I would wear the L'ombre night and day if it didn't have that rose note. I SO love the first few moments of it. Duh! I see that you've reviewed both! I was just in Tak last week and found no such $19 bargain. Oh, the Gobin Daude line is sadly long gone. There were rumors here & there that it would be back, but I've given up. Seve Exquise, should you ever happen to see a bottle in a garage sale, was sweetish green, but lovely and very unusual. This is one of the four 15 ml bottle-set I bought from a business trip. I wore this in the office today and it is just as lovely as you described it, Robin. I love the green-rose interplay. And I am quite happy with the sillage. Thanks for the review. Nice — that set is so cute! This is an excellent review of a special perfume. I wonder though, if others get the darker notes that somehow sound below the harmony of sharp green and rose? I find that there is a subtle note almost of sweat, which sounds unappealing but gives this a depth and sensuality that posts about gardens don’t seem to capture. It’s almost as as if someone was crushing current leaves on leather. A very adult take on freshness. I sometimes layer it with a dusting of Demeter’s Dirt. Oh, great layering idea, I’ll have to try that!